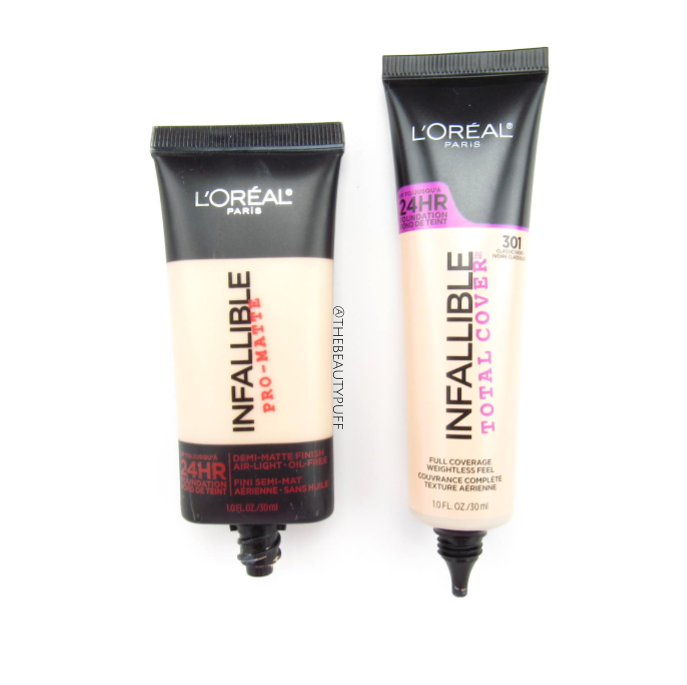 L'oreal's Infallible line has been my go-to for foundation ever since they came out with the Pro-Matte formula. When I saw they were coming out with a Total Cover version, I knew I wanted to try it. 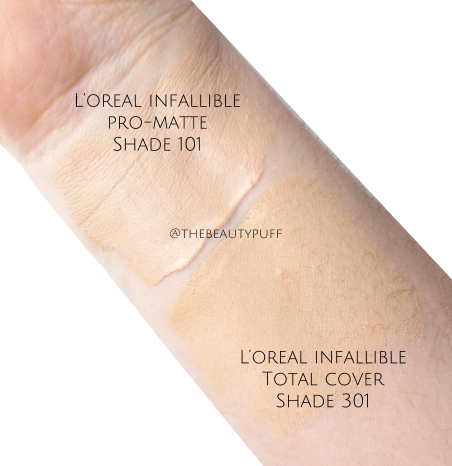 I have the shade 301 in the Total Cover formula and 101 in the Pro-Matte. I'll go more in depth on the Total Cover formula in this post but also compare the shades between the formulas. Here we go. 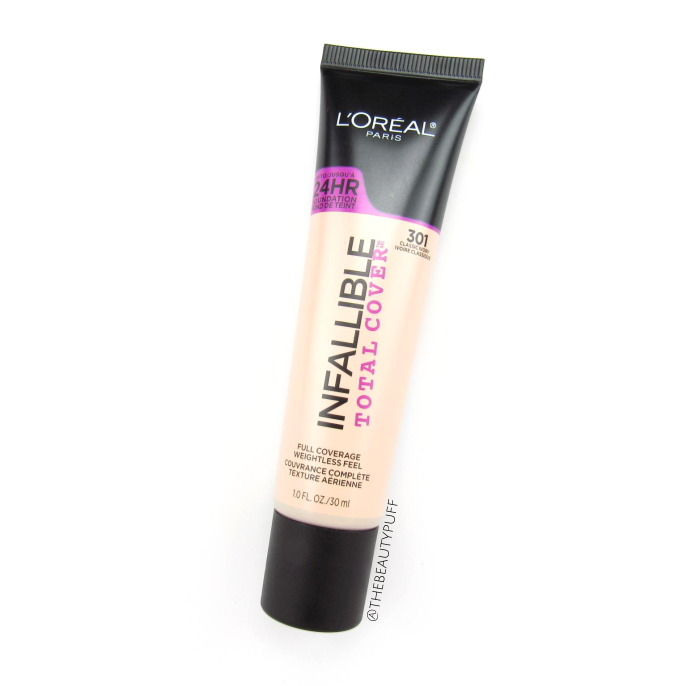 Packaging | Like the Pro-Matte formulation, the Total Cover foundation comes in a great squeeze tube which is ideal for dispensing, application and travel. I'd take this style over a pump any day.. just my opinion! The end of the Total Cover dispenser is much narrower than that of the Pro-Matte. You could literally draw a line of foundation it is so precise. This allows for getting just the right amount with no waste. Formula | The Total Cover formula is a light-weight mousse-like formula. There's no dripping or leaking to worry about that's for sure. It's easy to spread and apply on the face and feels practically weightless once set. Application | For my testing purposes, I used a light-weight moisturizer (Hada Labo Replenishing Hydrator to be specific) and my usual One Heck of a Blot primer by Soap and Glory. These are typical products I use, even with the Pro-Matte formula. On one side of my face I used a Real Techniques sponge and on the other side I used the Elf Ultimate Blending Brush. Nothing too fancy, but I wanted to see how each side compared. In terms of coverage and blending, I didn't see much of a difference. However, the sponge softened the look of pores more than the brush. I used a stippling motion with the brush since it seemed to work best with the mousse-like formula. Overall, as long as you work in sections, I think you can take your pick with your applicator. Coverage | While I wouldn't say this foundation would cover tattoos, it does have great coverage. It covered redness and under the eyes really well. If you have particularly stubborn dark circles and blemishes, you may want a bit of extra coverage. I didn't use a ton of product (you don't need to) because I wanted to see how it performed on a normal day with no extra effort. I'm really pleased with the balance of coverage and how it looks on the skin. You can obviously tell it's makeup if you look close, but nothing looks heavy or unnatural. Finish | Claims on the back of the bottle say this foundation is a natural finish. When I look in the mirror I see a matte, but not flat, finish. It is not the least bit cakey so the addition of powder products won't make it look heavy or unnatural. I don't even see the need for too much powder and that's saying a lot since my skin is so oily, particularly around my nose. I just use a loose translucent powder and you don't need much with this foundation. Overall, I love the finish and have no complaints. Longevity | I haven't worn this foundation for 24 hours (I don't think I ever would), but I feel it lasts longer than the Pro-Matte in terms of keeping oil at bay. My makeup looks fresh with the Pro-Matte, but my nose still manages to get a bit oily at the end of the day. I think I get a bit more out of the Total Cover formulation in that respect. Shades | One thing that bothered me about the Pro-Matte line, was that I felt I was in between the first two shades. I stuck with the Classic Ivory (101) because I'd rather have it be a bit lighter than too dark. (Bronzer is my friend.) The Classic Ivory (301) in the Total Cover line is the tiniest bit warmer and I feel looks better on my skin. I'm not sure it would make a huge difference if the 101 Pro-Matte is your perfect shade. So if you're Classic Ivory in the Pro-Matte, go with the same shade in the Total Cover line. Final Thoughts | A+ for me! I have been struggling with my "go-to" foundation for a while now because I wanted a bit more oil control, longevity and a better color match and I definitely found it. The Total Cover formula is really the whole package for me. Definitely a new favorite. Have you tried the new Total Cover formulation? Check out all the shades on Ulta's website below.